I promise that I have more to blog about besides what I made for dinner. It's just that every time I made something that is easy and good I think, "Gosh dang. People need to eat this." Anyway, the title of this post is what I said to N8tr0n on google chat while we were trying to think of what to eat for dinner. I actually did make something chicken based and fortunately, it was not stupid. This recipe is from Everyday Food which has been my go-to resource for recipes lately (when I'm not using the grilling book, that is) Here's a little unpaid plug for Martha's magazine (because I'm sure she needs it): I love this magazine and would highly suggest subscribing to it. Rachel gave me a gift subscription for Christmas, so I suppose I would first recommend that you get a friend to give it to you as a gift. Or, you can try reading it or checking out past issues at your library (checking out back issues of magazines happens to be my new obsession). Anyway, on to why I love it. My main reason for loving this magazine is: INSPIRATION. Since it is a monthly magazine, there is a lot of emphasis on what is in season, and there is always several recipes with the same ingredients. Sometimes I think that some of the recipes can be a little bland, but they can usually be spiced up a bit for our tastes. I also like that it reminds me of things that I haven't cooked in a while. For example, a couple of months ago it had a recipe for BBQ chicken sandwiches topped with Cole slaw. I thought the recipe looked a little blah but I ALWAYS have some of my mom's secret BBQ sauce on hand and "hot dang would ya look at that, I had cabbage too." Okay that's enough writing for something I'm not getting a kick-back for. This is a quick sandwich recipe that is amazingly good considering the few, cheap ingredients it includes. It starts with No Fail French Bread. I would recommend making this the day before or the dinner will take considerably longer (like it did for me tonight). Of course you could always buy a loaf of French bread at the store, but these days of job-less-ness, N8tr0n and I don't do much "running to the store to pick up..."
Okay so you've made your French bread, eaten half the loaf and confirmed that it is delicious. Marinate 1 lb. chicken (I used thighs which were great because they were flavorful and juicy) in any leftover lemon juice and a couple Tablespoons of oil (you only have to do this for a few minutes). Season w/ salt and pepper and either broil or grill until done. (I grilled them...duh. If you want to grill them too and you're using thighs, they need about 10 min. on Direct High heat, turning once). 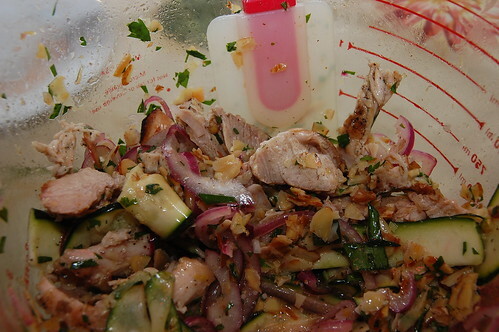 Once chicken is done, shred it and add it to the zucchini mixture. Cut French bread in half length wise and fill with mixture. Voila! N8tr0n and I decided to schmear a little mayo on one side of the bread. We also added tomatoes and a little sprinkle of Kraft Parm. Seriously, you should try it. You will be so proud of your awesome dinner! I seriously wish that magazine I made for my class were a real magazine--I'd get you a subscription. That looks delicious! I love chicken. Love. it. Ditto to French bread and unusual sandwiches. Everyday Food is a good resource, as is their website.